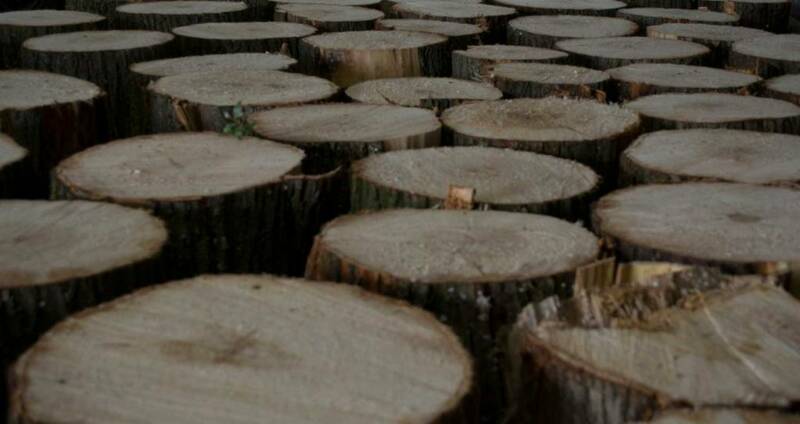 Whole trees are transported into our yard either using our own lorry or a local contractor with a larger vehicle. The trees are then cross cut into 28 inch ( 71 cm ) lengths with chainsaws. Before despatch to manufacturers in the UK and throughout the world the clefts are graded into various categories from wood suitable for the cheapest boy’s bat to that for the finest players who have obtained Test Match status. 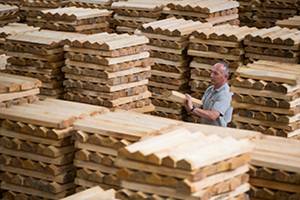 Grading is firstly done as soon as the blades are sawn to give an approximate idea of stock levels. Then when the blades have been dried one of the directors Jeremy Ruggles grades each blade himself very carefully before dispatch to the customer. We have found this to be the only way to offer good, consistant quality. 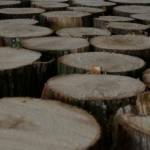 We have many different grades, each one suitable for a particular market. Here we have outlined some details of the most popular. Please note that these descriptions are for rough sawn willow clefts / blades and NOT finished bats. Generally you will find less grains in finished bats as we saw the blades wider than the finished bat and therefore some grains are removed during processing. This is a middle grade that is produced in much higher numbers than the top grades and it offers very good value for money. A Grade 3 Blade has up to half colour across the blade which again has no direct relation to the playing ability of the wood, it just has less visual attraction. There will be a minimum of 5 grains on the face of the blade which may not always be perfectly straight. Again some small knots or butterfly stain may be present with sometimes more prominent “speck”. A Grade 4 Blade is normally over half colour or contains butterfly stain (see our page on Imperfections in Willow). It will still play as well as the other grades. Any number of grains are possible with often only 4 grains, the willow containing ‘butterfly’ stain is very strong, there could also be more “speck” and other faults. The only main differences in the grade are the visual appearance of the wood including amounts of butterfly stain plus the number of blemishes or knots on the blade and the straightness of the grain. Generally the more colour in the blade the lower the grade, there is however negligible difference in the playing ability, it is purely a perception that if it looks good it will play well, this is not the case. We are finding with the climate changing and growing seasons getting longer, that the amount of narrow grain we are producing is getting less as a percentage. There is nothing we can do about it and players will have to adapt in the coming years to accepting more wider grains. The two factors affecting the weight of the finished bat are the moisture content and the density of the wood. We are the only manufacturer supplying part-naturally dry cricket bat blades to the world market. This method (which takes months in top grades) has, by experience, proved the best method to dry cricket bat blades. The blades are allowed to lose moisture over a longer period of time which gives a far more even moisture content and means that you are far less likely to get moisture trapped inside the blade, which causes heavy weight. When they are put in our driers after air drying to get the correct moisture content the results are unbeatable. Although we can give no fixed guarantees on the moisture content and weight, we do test a few blades in each drying cycle to make sure the batch is ready to come out. Jeremy Ruggles has been fine tuning the drying method since he joined the company and our customers say that now we have the most consistently dried blades you can buy, of course we still get heavy blades as well. The final factor that can alter the weight of a bat is of course in the making. When choosing a cricket bat most players ask for a specific weight. In our opinion when choosing a bat more emphasis should be put on the pick-up and feel of the bat rather than any specific weight. A bat can weigh 2lb 14oz but if made a certain way with the weight distributed differently it could feel like a 2 lb 7 oz bat, it is basically down to the skill of the bat maker. One would argue that if asked to guess the weight of a bat to the nearest ounce no player could get it right more than once in ten guesses at the very best. We have also restricted the size of our blades to an optimum size that allows us to get a good number of blades per tree and allows the edges to be big enough to give extra power to the finished product.